GoBike are extremely concerned with plans that have gone public today on the redevelopment of Byres Road. While we are pleased to see improved space for people on foot, we believe that money spent on major projects such as this on busy roads should always also include segregated cycling infrastructure, safe for everyone of all ages and abilities, and that is not in evidence here. The cycle lanes in these plans appear to be nothing better than paint on the road and do not constitute “safe cycle routes” as promised. 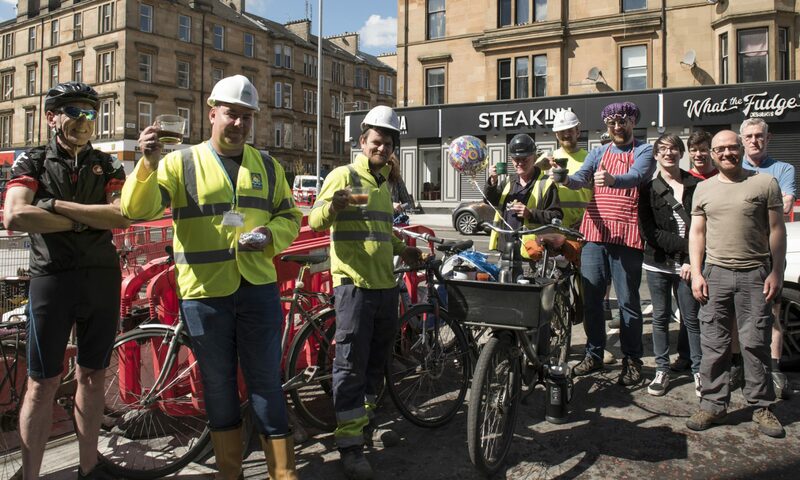 From what we can see, the lanes proposed for Byres Road will force people on bikes into the stream of motor traffic each time the lanes are blocked by parking cars, buses, loading lorries and the inevitable debris usually swept to the side of the road. We plan to attend the drop in session tomorrow (Thursday) to ensure that we are armed with all the facts, but if you are also concerned with what you see and would like to do something about it, please meet us on Thursday evening (24th May) at 6pm, upstairs in the Curlers Rest. Next PostNext Consultation Digest Issue 10, 30 May 2018, Byres Road and lots lots more!